In the kaolin mining process, crushing is the first step. Using the crushing plant, we get kaolin particle, then using the grinding plant with one type of kaolin mill, we get kaolin powder. Kaolin clay is formed from the weathering of silica rich rocks such as granite and gneiss, it occurs with feldspar and quartz. The clay is separated from the other constituents by washing with water cannons and the slurry is then centrifuged to remove 75% of the minus 0.002mm fraction. Clay is also processed to remove any contaminating materials such as iron, aluminium quartz and feldspar. It is dried and fired to produce molochite and then fed into a ball mill. Various product gradations can be produced. Kaolin clay processing plant with crusher, grinding mill is used for manufacturing kaolin clay powder. SBM can design kaolin wet processing plant and dry kaolin processing for kaolin clay manufacturing. 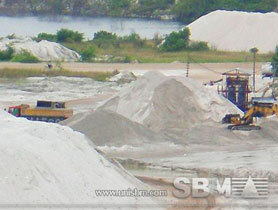 SBM also offer kaolin processing plant machinery including crusher, grinding mills, screen for sale. "SBM will provide you with complete kaolin crushing grinding plant including stationary and portable plant."